Sky Tower punctuates downtown Auckland like an exclamation point. From the main observation deck a little more than halfway up the 1,076-foot-high telecommunications tower, the city and beyond stretch out like a seamless tapestry of land, sea and sky. As New Zealand’s center for culture, business and transportation, and with a land area nearly the size of Los Angeles, one could be forgiven for thinking Auckland is the archipelago nation’s capital (that would be Wellington, though Auckland was the capital from 1840 until 1865). After all, a third of the nation’s 4.3 million souls reside here, including the largest Polynesian community in the world as well as an expanding Asian population. Auckland’s surrounding Hauraki Gulf and the Pacific Ocean exude a beauty that draws thousands of yachts to its harbors, which explains the moniker City of Sails. With a temperate climate, educational and employment opportunities, affordable housing, diverse cuisine, music and arts events, wide open parks and nature trails, a robust economy and an overall laid-back feel, Auckland is regularly ranked as one of the world’s most livable cities. Jewish Auckland’s small but warm and vibrant community boasts both Orthodox and Progressive congregations. Beyond the city, Jewish communities exist in Wellington, Christchurch and Dunedin. Unfortunately, after the February 22nd earthquake that hit Christchurch, the main synagogue there, Canterbury Hebrew Congregation, was damaged, and the Chabad offices were completely destroyed. It was the Maori who first settled this actively volcanic land. They call the area Tamaki Makau Rau, meaning “isthmus of one thousand lovers.” In 1840, the Treaty of Waitangi essentially granted sovereignty over all New Zealand to the British (the treaty remains a source of friction). Early settlers, Jews included, were largely retired soldiers and their families who went on to earn their keep in mercantile industries. The arrival in 1830 of Joseph Barrow Montefiore at Kawhia, a few hours drive south of Auckland, marks the beginnings of Jewish history in New Zealand. He was a trader, like other first arrivals, dealing mainly in flax and whale oil, but he stayed for only 18 months. The first Jewish settler was Joel Samuel Polack in 1831. Born in London to Dutch parents, he established a successful general store and later branched out into shipping, mainly to California, where he died in 1882. When New Zealand became a British colony in 1840, fewer than 30 Jews called it home. That same year, the Auckland Jewish community was founded and, in 1842, they acquired land for their first cemetery. The Wellington community was founded in 1843 by Abraham Hort Sr., who arrived with written authority from the chief rabbi of England to establish a congregation “to promote Judaism in whatever way fit.” Hort brought along several Jewish women, who later married into the newly founded community. The discovery of gold in Otago and Westland on South Island in 1860 enticed hundreds more Jews and led to the founding of the Christchurch (1863) and Dunedin (1864) communities as well as smaller ones in Hokitika, Timaru and Nelson. Though the rush had slowed a decade later, the Jewish population in New Zealand numbered 1,500 by 1900. In the 20th century, Jewish immigrants arrived in a few waves. The first was about 1,000 from Germany escaping the rise of Nazism in the years leading up to 1939 (New Zealand admitted few refugees during the war, however). Another wave hit in 1956 as Jews fled the Hungarian uprising, and an influx from the former Soviet Union came in the 1980s and 1990s. Most recently, Jews have arrived from South Africa and Israel. Due to the nation’s largely secular stance and only minor manifestations of anti-Semitism, Jews have assimilated comfortably into New Zealand. However, there has been an attempt to ban kosher slaughter; currently, shehita of poultry is permitted, but the final status of beef and lamb remain undetermined. New Zealand’s far-flung geographical location sets it apart from other Jewish communities—Dunedin is the closest population center to Antarctica and is home to the world’s southernmost synagogue—but that hardly means Jews here are disconnected. There are seven synagogues in New Zealand serving an estimated 10,000 Jews, with the majority residing in Auckland (Wellington is home to the next largest group, followed by Christchurch, Dunedin and Hamilton). While this number represents just 0.25 percent of the nation’s population, Jews maintain a formidable presence across all strata of society. Communities are well organized and active, yet relatively insular. Auckland has two Jewish hubs. 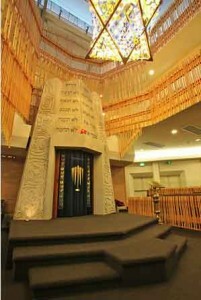 Located in the heart of town at 108 Greys Avenue, the Orthodox Auckland Hebrew Congregation (011-64-9-373-2908; www.ahc.org.nz) is the largest Jewish center. Opened in 1967, the modern building was designed by local architect and congregant John Goldwater. It houses two synagogues, a Holocaust memorial, the only Jewish deli in the country, the B’nei Akiva youth movement (www.bneiakiva.org.nz) and the Kadimah School (www.kadimah.school.nz). Twenty minutes from downtown in the Manukau suburb, Beth Shalom, the Progressive Jewish Congregation of Auckland (180 Manukau Road; 64-9-524-4139; www.bethshalom.org.nz), caters to the liberal needs and interests of the community. It is also home to the Zionist youth movement Habonim Dror. Beth Shalom is a member of the Union for Progressive Judaism. Despite a relatively robust economy and a diverse community, many young Jews head to Australia and Israel to seek greater employment and religious opportunities. To counter that population depletion, Auckland Jewish Immigration, under the auspices of the AHC, lures newcomers from South Africa and Israel, for instance, by promoting community life as much as New Zealand itself. Immigrants are generally seeking a safe, English-speaking country in which to raise their children. Hadassah International (64-9-309-7426; www.hadassah.co.nz) has a small but vibrant chapter in Auckland as well as some members in Wellington. The group’s main mission is to support through fundraising the Hadassah hospitals in Israel. A good place to start exploring is at Princes Street Synagogue (19A Princes Street), the original home of the AHC. 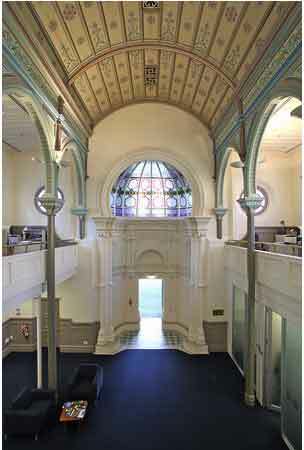 Built in 1885 of a blended classical and Moorish style, the building is one of Auckland’s notable period structures. Its glorious two-tier interior features a wood-paneled ceiling, Arabian arches and stained glass. After the AHC outgrew the space in 1969 and relocated, the building was left to decay before it was renovated and developed for commercial purposes in 1989. Today, the building is called University House, and serves as the External Relations Office for the University of Auckland. A vineyard on Waiheke Island. Photo courtesy of Kieran Scott/Tourism New Zealand. Around the corner on Bankside Street is the former home of pioneer Jewish trader Henry Keesing. While not open to the public, the house is a fine example of 1850s architecture. From there, it is a 20-minute walk to the present-day AHC location. It is a beehive of activity and visitors are welcome to view the Holocaust memorial (there’s another Holocaust memorial outside of town in the Beit Olam section of the Waikumete Cemetery), admire art by congregants on display and breakfast or lunch at the kosher deli. There is also a mikve on the premises. A downhill stroll along Greys Avenue leads directly to Aotea Square, a public area just off the busy Queen Street shopping zone that’s used for open-air concerts, markets and public rallies. A statue of colorful Jewish mayor Sir Dove-Myer “Robbie” Robinson, who officially opened the square in 1979, stands as a centerpiece. A park in the Parnell neighborhood was also named in his honor. It features native trees—including the Manuka, or tea tree—and a garden with 5,000 rose bushes. Walking uphill along Queen Street takes visitors past Myers Park, named in honor of Jewish mayor Arthur M. Myers. Turning left on Karangahape Road (called K Road) at the top of the hill leads to the historic Symonds Street Jewish Cemetery, final resting place for several of Jewish Auckland’s pioneers, including David Nathan, a captain of the garment industry also considered the father of the Jewish community. In 1842, the community acquired the acre of land that was used until the late 1800s, when all cemeteries in the city were closed. The community returned the unused portion of land to the city and today it is a park. A plaque on the corner of Symonds Street and K Road commemorates these events. Sitting atop the Domain, the city’s preeminent park, the Auckland Museum (64-9-306-7067; www.aucklandmuseum.com) features a small but informative Holocaust exhibition, including testimonies by local survivors. The museum also offers visitors lessons on the nation’s Pacific peoples, its natural history and its war stories. About an hour from town, the Matakana Coast is dotted with deserted bays, reserves, vineyards, arts and crafts stores and features a weekly Saturday farmers’ market. Or take a 35-minute ferry ride to Waiheke Island, the country’s third most populous island, to explore its vineyards, olive groves and cafés. The AHC offers a range of educational classes including a men’s Talmud class each Wednesday evening; the Women’s Beit Midrash meets monthly. The center also welcomes talks by spiritual leaders, holds fundraising events and hosts exhibitions. Beth Shalom holds plenty of events, too, including a vegetarian potluck night on the first Friday of the month; guest speakers; Israeli folk dancing; and family camps for workshops, prayer and schmoozing. Raye Freedman Library (www.rfl.org.nz) in the eastern suburbs is a Jewish community library that aims to promote Jewish secular education by providing educational, cultural and informational resources on subjects of Jewish interest. Its namesake philanthropist was a successful businesswoman. Also bearing her name is the Raye Freedman Arts Centre (www.rayefreedmnarts.co.nz), a state-of-the-art public theater complex on Silver Road in the Epsom suburb that is used for concerts, theater and other functions. Nathan Homestead (nathan.home stead@manukau.govt.nz) is the grand former home of the Nathan family. This heritage site, 15 miles south of town at 70 Hill Road, was built in 1925 and is now the Manurewa Community Arts Centre. It hosts exhibitions, concerts and performing-arts shows. An array of Jews past and present have contributed to molding New Zealand’s political, cultural and communal arenas. Perhaps most surprising is the number of high-ranking Jewish politicians. Sir Julius Vogel was premier from 1873 to 1875, and again in 1876. Sir Francis Bell, prime minister for only a few weeks in 1925, and John Key, the 38th and current prime minister, are of Jewish extraction. There have been five Jewish mayors of Auckland. Sir Dove-Myer Robinson served from 1959 to 1965 and again from 1968 to 1980. No one has had a longer tenure in that office. Arthur M. Myers held the office from 1905 to 1909. Asher Asher was the first chief of the Auckland Fire Brigade, established 1902. Prior to that time, insurance companies had their own brigades that would respond only to fires for properties they insured. Asher’s great-grandson David Levin is a current member of Beth Shalom. Contemporary figures include Dr. Peter Gluckman, the first chief science advisor to the prime minister and the only New Zealander elected to the Institute of Medicine of the United States National Academy of Sciences. Marti Friedlander—who emigrated from Great Britain in 1958—is arguably New Zealand’s most celebrated photographer. Though she never specialized in Jewish photography, she does have the finest collection of photos from the opening day of the current AHC building. Dame Lesley Max is CEO of Auckland-based Great Potentials, an organization committed to bettering family relations and reducing disparities in New Zealand society. Replacement Girl (Tandem Press), a novel by Ann Beaglehole, tells the story of a young Jewish Hungarian woman who arrives in New Zealand in the 1950s and struggles with her newly adopted country, culture and a failed marriage. Identity and Involvement: Auckland Jewry, Past and Present (Dunmore Press), edited by Ann Gluckman and Laurie Gluckman, is a collection of essays on the history and achievements of the community since 1840. Covering Jewish history nationwide, The New Zealand Jewish Community (Lexington Books) by Stephen Levine focuses on the community’s unique location and describes its ties with Jewry worldwide. The History of the Jews in New Zealand(Reed), by Lazarus Morris Goldman, is available free online at www.nzetc.org. A Standard for the People (Hazard Press), edited by Stephen Levine, tells the story of Jewish life in Wellington, from colonial times through to contemporary days. The book was compiled to mark the 150th anniversary of the Wellington Hebrew Congregation in 1993. Communication, directed by Christopher Banks, is a 2010 award-winning short film about Jacob, a gay Jewish university student from an Orthodox family, and his relationship with Andrew, his mentor who is nearly three times his age. A two-and-a-half hour drive from Auckland is the Jacaranda Lodge (www.jacarandalodge.co.nz), a tranquil six-acre farm on the scenic Coromandel peninsula. The area is renowned for natural attractions such as bird watching, a butterfly orchard, beaches, scuba diving and the charms of local town life. The lodge provides kosher meals, and its Jewish host, Robin Münch, speaks Hebrew. Other options less than 200 miles from Auckland include: The Waitomo Caves (www.waitomo.com), a magnet for visitors wishing to experience glowworms and eerie rock formations; and Rotorua, known for its geothermal activity, including geysers and hot mud pools. Bay of Islands is a popular fishing, sailing and beach destination. Flights to the other Jewish centers are short and generally cheap—from approximately $60 one way. Wellington is a one-hour flight; Christchurch, 80 minutes; and Dunedin, two hours. The Duxton Hotel (100 Greys Avenue; 64-9-375-1800; www.duxton.com.au), next door to the AHC, overlooks Myers Park and is just minutes from Queen Street, the main shopping area. YHA Auckland International (5 Turner Street; 64-9-302-8200) is a five-star-rated hostel just five minutes walk from the AHC. These accommodations are ideal not only for travelers on a budget, but for families who prefer to prepare their own meals in the full kitchen. Greys Avenue Deli (64-9-373-2908, ext. 401; www.greysavedeli.co.nz) is located on the premises of the AHC. The restaurant serves daily specials (hot and cold), soups and muffins, and it sells imported kosher food items, Judaica and books. Raw Power Cafe (10 Vulcan Lane; 64-9-303-3624) serves vegetarian meals from Middle Eastern-style wraps to lasagna. It is conveniently located downtown just off Queen Street. Auckland’s hilly streets are easily negotiated by foot, taxi or Link Bus (www.linkbus.co.nz), including Jewish points of interest and the trendy neighborhoods of Newmarket (for fashion and footwear), Ponsonby (for boutiques and cafés) and Parnell (for jewelry and galleries). Parnell also boasts La Cigale, a colorful weekend French-style farmers’ market. For organized tours of downtown or further afield, Discover New Zealand (www.discovernewzealand.com) offers a wide range of options from half-day excursions to multiweek adventures. The pioneers of yesteryear would scarcely recognize Auckland today, but they would surely delight in its modern style and dynamic cultural appeal. The gold rush may be long over, but the pioneer spirit remains. It rewards every traveler who makes it to Aotearoa—Maori for New Zealand—meaning the land of the long white cloud. Jono David is an American photographic documentarian of Jewish communities worldwide. His online photo archive can be seen at www.jewishphotolibrary.com.